Science Objects are two hour on-line interactive inquiry-based content modules that help teachers better understand the science content they teach. This Science Object is the second of four Science Objects in the Force and Motion SciPack. It provides a conceptual and real-world understanding of Newton’s First Law of Motion. All objects will maintain a constant speed and direction of motion unless an unbalanced outside force acts on it. When an unbalanced force acts on an object, its speed or direction (or both) will change. The tendency of objects to maintain a constant speed and direction of motion (velocity) in the absence of an unbalanced force is known as intertia. Even in the most familiar, every day situations, frictional forces can complicate the analysis of motion, although the basic principles still apply. I liked the way this was mapped out and found it to be very informative! It makes for a nice refresher! I really enjoyed this tutorial. I thought the interactive simulations were fun. I went through each of them a few times. I'm sure elementary students would enjoy them and find them helpful, also. Explanations in the tutorial really simplified concepts in ways that would be easily understandable for struggling students. This review was informative and I will be able to use it when we teach this next month. Once you get started you won't stop! The information presented is easy to relate to and it's a great resource for educators. I really enjoy Science Objects. In 1-3 hours, the Force and Motion: Newton's First Law Science Object will help me re-learn, refresh, or learn for the first time some critical science concepts I will have to know to obtain my Science Educator credentials. I appreciate that I can complete them at my own pace, and that, if used as park of a SciPack, I have access to a content expert to go to for help. The NSTA Learning Center Science Objects are very beneficial! I found this object helpful. The animation helps to clear up some misconceptions that students may have. I will use the animation sections in my classes. I found this information to be very helpful. It is especially helpful for someone who is lacking the confidence when it comes to content knowledge. The content brought up and clarified ideas and misconceptions that this law can create. It will be easier to teach to my students with my deeper and more complete understanding. Very good demonstrations of the property of inertia, and describing Newton's first law of motion. Like the links of how to perform the activities on own and can easily use them with my students. These science objects are amazing. They are extremely helpful with the animations, questions, and activities. However, there is one piece that I feel is incorrect. On page 3, it talks about the river stopping its flow after it reaches the ocean or infiltrates into groundwater. Groundwater continues to flow and the Ocean is continually flowing. As an elementary teacher, this science object was particularly useful in that it provided a good understanding and practical examples of Newton’s First Law. It also offers insight into the common preconceptions that my students may have regarding force and motion. How much of a deeper understanding do I need to completely understand Forces and Motion: Newton’s First Law? I enjoyed reading the light-hearted tutorials on Newton’s First Law. The last time I had an intensive course on Physics, I was popping pimples and trying to cram for my SATs. This article covered Newton’s First Law; objects continue to stay at rest or in constant motion, until an outside unbalanced force acts upon that object. Galileo coined the term friction, a force rubbing two objects together to slow down the objects that is in constant motion in a straight line. To our naked eye, we know that a marble on a track would eventually slow down after a couple of feet, no matter how high the vertical drop. Friction is the force that slows it down. It is the outside unbalanced force. I was one of the people who had the misconception about inertia being a force, not being related to mass and weight. I did gain a better understanding from this tutorial. It helps with the graphics and activities. This video extended as well as clarified my understanding of Newton's 1st Law. As a matter of fact I conducted the tablecloth activity in class to demonstrate it to my students. They were able to understand it better. The tutorial was very informative; it was surprising that Galileo had the idea of the first law before Newton. The law was broken up into small pieces which were easier to understand and to explain to our students. The interactive activities were easy enough to demonstrate in the classroom. The 1st hands-on activity was demonstrated in my classroom in the beginning of the school year as a warm up. Many of the suggested activities were utilized by me in teaching this lessons. My learnings of this law expanded my knowledge. I still have to widen my observation as to the daily application of this law. This tutorial is really helpful because it is very easy to understand and provides me with the real world understanding of the first law of motion. I have demonstrated the coin and card trick for my classroom in the past. I have seen the dishes and the tablecloth demo but, I have never tried it. I think I will give it a shot because it will help my students to understand the first half of the law easily.This tutorial really helped me understand inertia. I saw a presenter demonstrating the curved ball track demo for us during the PISA summer workshop. However, at that time I did not understand it. The video clip gave me clear understanding of this concept. The self check questions and the videos helped to broaden my understanding of the law. They cleared some of my misconceptions about inertia.I definitely plan on using this resource in my classroom. The interactive simulations were fun. I tried each of them several times. I'm sure the students would enjoy them, also. Explanations really simplified concepts for struggling students. The quizzes were quick ways to assess what you know. I found the drawing, like the ones showing small/large force = small/large accelaration to be helpful in getting Newton's Second Law across. Activites were similar to those we did at the PISA 2009 Summer Institiute, such as the straw and balloon activity, so it served as a great refresher course! I loved the way the NSTA tutorial explained net force/unbalanced force. If two people are pulling on a rope with the same amount of force, or pushing an object with the same amount of force it will not move. The NSTA explained it in a way that I will be able to model it, so my students will understand the concept. I learned quite a few things on this NSTA site. I thought I knew more than I know. First of all, I learned that inertia is a property of an object, not a force. Secondly, I learned the inertia of an object does not depend on how fast it is moving. Being a new science teacher, I am excited to share with my class some of my hands-on knowledge, instead of always groping for the text book. I can model it for them with confidence. I really liked the online tutorial on Newton's First Law of Motion. I can say I knew this already but after going through the tutorial I can say that I understand it better. It was very in depth and easy to understand. Most Science reference materials use very complicated terms that are hard to understand, let alone my students who are only in 4th and 5th grade. I also found the interactive videos and hands-on activity suggestions really helpful, I will definitely use them in class. I must say I have done some of those activities but the videos would be a good addition to better explain the concept to my students. Having the quiz at the end of each topic also helped me assess my grasp of this New ton's First Law. Physical Science is definitely not my strong point, but this tutorial definitely helped me better understand Newton's First Law. The activities are simple and easy to use in my third grade classroom. I especially like the curved track and marble activity. I would hope that my students would eventually understand Newton's Law when doing this activity. The friction activity is another one that is great for young students to do to understand how an unbalanced force affects the motion of an object. Using these activities will make me more comfortable in teaching this concept! 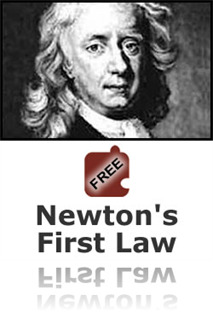 This is a fun way to help students have a better understanding of Newton's First Law. The way this is set up allows the viewer to actually see the concept in action allowing for a more concrete way to understand it. The quizzes allow you to check your understanding and further clarify any areas which cause confusion. The Newton’s First Law of Motion tutorial will be extremely helpful to use with my fifth grade students. The easy to understand language and simulations make Newton’s First Law comprehensible. As an added bonus, the tutorial goes in depth to explain how objects in motion will tend to stay in motion, and describes how objects will react to outside forces depending on the amount of force being applied over a given period of time differs. The simulation track and hands-on activities are equally beneficial and will come in handy during lessons. This tutorial on Newton's First Law was very informative and interesting. The activities shown made it easy to relate to real life using prior knowledge. These activities would be easy to facilitate in the classroom as well. The hands-on activities would help students to understand that an object at rest tends to remain at rest unless acted on by an unbalanced force. Very enjoyable and relevant to our lessons at PISA! If you asked me what Newton's First Law was I would be able to recite what I think most people would say..."An object at rest..."however, my understanding of the scientific theory behind the law was limited to rote memorization. Reading the informative article, Force and Motion: Newton's First Law, I was able to connect the theory to real life examples. The hands on activities were excellent for students and the accessible lesson plans make incorporating these activities that much easier. The article was interesting. It helped the reader gain a better understanding of the concept and clarified any misconceptions the reader or students may have. The activities were fun and added more insight. For this First Law my students utilized tne computer lab to look at child-appropriate sites which also had reading and activities related to the law. After that the students tied a string to a rubberband ball spun it overhead then released it and observed that rather than continuing in a circular path it took off in a straight line. This tutorial was definitely a refresher for me from the summer program at Stevens. The text was actually easy to understand. I especially liked the videos that were provided. Although I have seen them demonstrated, I forgot just how interesting they are. I know my students would love to see this in the classroom. The demonstration of the index card and coin would help them to understand the First Law of Motion. Whenever I include a hands on activity, my students are instantly engaged! Now I just need to practice the demonstration so that I could share with my students!! Wish me luck! This article was very interesting and informative. My favorite and most helpful part is the 'curved track' animation that I can put up on my projector in class to help my students with this common misconception. Using this animation will let my student’s first see 'on the big screen' (that's what they like to call it) to show them an example of our activity.In my lab class we take a tied ball and spin around in circles, releasing the ball. The students observe the ball goes in a straight line when the ball is release rather than continuing in a circle. “Force and Motion: Newton’s First Law” is a helpful review of Newton’s First Law. In my classroom, I have found it easier to teach the first part of Newton’s law. I have used the coin and index card activity to demonstrate this law, but I plan on using the simulation of the tablecloth and dishes to further demonstrate this law to my students. I found the explanation of the second part of Newton’s law very helpful. The ball on the track is an activity that I plan on using in my classroom (it is a great way to incorporate measurement, too.) It was helpful to have a review of inertia towards the end of the tutorial. I also found it helpful that this tutorial provided questions and explanations to assess your understanding of the material. I thoroughly enjoyed it! The tutorial was informative and well structured. The text was simple to understand and written in a matter that allows for full understanding of concepts. Not only was it easy to understand, but the language used was almost humorous which decreased confusion. I appreciated the way the tutorial was broken up into different sections. This allowed for full focus on the concept being presented, rather than more than one at once. The use of visual aides and videos gave further understanding of the statements found in the laws. I must confess that these were always somewhat confusing for me. However, after this tutorial, I feel more confident in my knowledge of Newton's First Law. The hands on activities made available are kid friendly and can be easily initiated in the classroom. I especialy like the conversational style of this tutorial. I think that the information presented is suitable for those who have some familiarity with the content, but need a "refresher" session. The video clips are excellent and the accompanying self-checking questions are very valuable. I like the link to the printable directions for the hands-on activities. I've seen the table cloth and coin demonstrations, but have never actually tried them. Now, with these directions in hand, I'm ready to "perform" in front of an audience! Who knew that studying Newton's First Law could be so much fun? "Force and Motion: Newton's First Law" is a resource that I will continue to utilize in my classroom. The coin with index card and the dishes with tablecloth are demonstrations which I have previously utilized in my classroom. These two demos are quite helpful in students' understanding of the first part of Newton's Law. However, in the past, the second part of Newton's First Law has been more difficult to demonstrate. With this resource, I will actually now be able to show the students the "Ball on a Curved Track Animation" which I believe will help clarify many of the students misconceptions about the second half of the first law. Aha! Clears us some things I wasn't really clear about. Well explained for an elementary teacher who has to teach a unit in each earth, life, and physical science at each grade level. This was effective for learning the first of Newton's laws. Great for all school age kids. All videos are "displayed" behind the front window that has the text. There is no way (that I can find) to get the video window on top so it can be viewed. I wasn't able to watch any video. This is a simple concise review of Newton's First Law. Great for a middle school teacher that is writing a pre test before or lab activity. This SciObject is better when you have completed the first SciObject in the series, on Position and Motion. Inertia and some of the basics of forces (friction) are covered. A good overview. Not only was this a great resource delving into several aspects of Newton's first law, the real-world examples this science object uses are a gold mine for potential lesson plans. I recommend! The videos that illustrated Newton's first law is a wonderful teaching tool for students in grades three thru four, because students will think it's some magic trick that they can do themselves. This will be great for "inquiry based learning. The first law says that an object at rest tends to stay at rest,and an object in motion tends to stay in motion,with the same direction and speed.A good example of this idea was the astronauts. You noticed that the tools float.They can just place them in space and they stay in one place. There is no interfering force to cause this situation to change. Showing the students this video, as well as the coin trick and dishes video, will encourage the childrern to use hands on experiments to further understand Newton's First Law. I know I enjoyed doing these myself and they certainly improved my knowledge. I liked the hands-on activities in this Science Object, but I would have liked to see more of them. I thought the activities the object had were very interesting and inquiry-based. I also like that the concept that forces act on different objects was explained more than once, in more than one way. This will be helpful when explaining the concept to students who may have misconceptions. I also like the idea of rewording Newton's Third Law to avoid misconceptions. The summaries were useful, as were the quizzes. I liked the explanation of the law as Newton would have stated it and then as a more usable definition.I've used the coin trick in my class and it does get the students thinking. I plan on using the tug of war example because it is an excellent illustration of net force and /or unbalanced forces. The explanation of inertia was also very good. I can adapt it to my fourth grade class quite easily. This tutorial is excellent. I have taught this law in my class using a Knex cars, washers and ramps. I already had a pretty good understanding of this law but this tutorial have excellent visual aids, hands on activities and self check questions which will be very useful for the students. I have always used the balloon racer activity with the third law of motion but after this tutorial I can try to teach second and third law with the same activity. I've always had a pretty good grasp of Newton's First Law, but the concept of "inertia" has never been clear. This aritcle made it clear. I have also been at a loss to demonstrate the application of friction to my classes, but that interactive activity allowing you to add or change the amount of friction would work well. I found the tutorial helpful in that it addressed several misconceptions that younger students have. For example, while most students understand that an unbalanced force will aid in moving an object, they tend to become confused about why an object stops moving. They may believe that a soccer ball that has been kicked will keep going until someone stops it.If they observe the ball stopping by itself, they assume the ball has simply run out of energy. Newton's First Law helps students understand that an object will keep on doing what it's doing until a force is applied. Activities we did at the PISA 2009 Institute were helpful in getting the point across. This tutorial served as a refresher for some of those activities, as well as provided me with simpler ways to state Newton's First Law. In relation to my prior knowledge I have taught the concepts of Newton's first law so I was familiar with the basic understanding that objects will remain at rest unless acted upon by an external force. Our activity during the summer with the toy cars was an excellent way to demonstrate the 2nd part of the law that states that an object will move in a straight line unless acted on by an unbalanced force. The tutorial did help me to better understand inertia and how it is connected to all of this. I learned that the inertia of an object is measured by its mass. The more mass the greater the inertia. I think many of my students sometimes have too much inertia!!! Newton’s first law basically states that if an object is at rest it will remain at rest, unless an outside force acts on it. This idea also applies to an object’s acceleration. If an object is moving in a straight line at the same speed (i.e. earth) it will continue to do so. An outside force is required to change an objects direction or speed. Then an easier concept to understand is net force. This means when there is equal force there is no force at all. The object does not move. The tutorial did have a few good simulators to show the concept of Newton’s first law. The lessons that I might do with my class would be the table cloth and dishes trick-to show the concept of inertia and an outside force. To show a net force I would probably demonstrate a game of tug of war. I would also like to show the simulators from the tutorial as well.